March 19, 2018 By Goodall Staff - s.h. You’re wondering if installing a swimming pool in your backyard will be a good idea. Well, of course, with every significant decision there will be pro’s and cons. But we assure you, the good will definitely outweigh the bad when it comes to the installation of an above-ground or in-ground swimming pool in your backyard. Skeptical? Keep reading to learn more about the top eight life-changing benefits of a backyard pool installation. There’s no doubt about it, life gets busy. Between work, school, friends, and everything else in between, it can be quite difficult to spend good quality time together as a family. That’s where a swimming pool can come in handy. Most pools have a large capacity that can accommodate most family members – and then some! Even if everybody isn’t in the pool at the same time, you can tweak your backyard swimming pool installation to cater to those who aren’t swimming. Features like loungers, outdoor furniture, gazebos, fire pits, and more can provide a place for those who aren’t in the pool to stay in the conversation and participate in all the fun. Who doesn’t want to cool down in the pool or spend time in a beautiful backyard paradise, after all? Exposing children to water at a young age can offer many benefits. For starters, children who grow up in and around the water are much more likely to be comfortable around it. Going to pool parties, swimming for exercise, working around the water, or even going into bigger bodies of water won’t pose an issue to your kids as they grow into self-sufficient adults. Secondly, a backyard pool provides you with an opportunity to teach children how to swim on a regular basis. They may develop these essential skills quicker than those who don’t have easy access to a pool or aren’t enrolled in swimming lessons. Knowing how to swim is imperative to their health and safety, as accidents in the water can be dangerous and sometimes fatal. Having this particular set of skills could help prevent a disaster. A backyard pool installation can help add to the overall value of your home. Both in-ground and above-ground pool installations can transform the backyard into a unique selling feature. Especially if your backyard is customized to be an outdoor paradise, complete with an inviting and luxurious atmosphere. Along with the physical features, a stunning landscape design can provide the finishing touches. Think walkways, mulch, flower gardens, garden edging, and more. Swimming can offer many wonderful health benefits. You should always consult with a physician first before treating a pre-existing medical condition on your own. Get off the couch and head to the pool! The summer heat can reduce our motivation to head outside, due to the sticky and humid conditions. 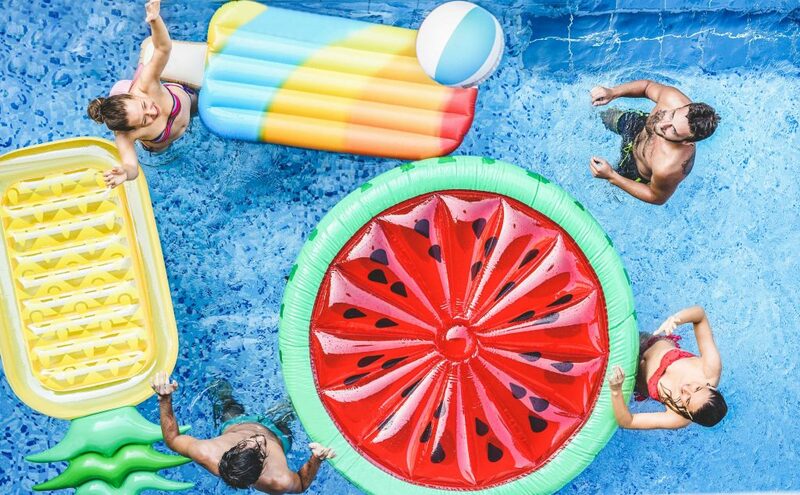 A backyard pool might just be what you need to get outside and enjoy the summer sun, without feeling fatigued or uncomfortable due to extreme temperatures. If you’re starting to feel cooped up and addicted to the air conditioning of your home, with restless kids and nothing left to do – it might be time to consider looking at above-ground or in-ground pools for sale in Pennsylvania. Did somebody say pool party? Well, it doesn’t always have to be a party, but a backyard swimming pool sure can boost your social life. Regardless if you’re inviting a friend or two over for a night of catching up and relaxation, or you’re hosting the next family reunion, your backyard paradise can offer the perfect place to host. Who doesn’t want to lounge by the pool, after all? With your brand-new outdoor pool installation, you’ll be the envy of all your neighbors and talk of the town in no time at all! We mentioned weight maintenance in the health benefits above, but it’s so important that we figured it deserved its own column. Regardless if you’re looking to start living a healthy lifestyle and lose weight or are just looking to maintain your current physical activity – a pool can help. The buoyancy of the water can help lift up to 90% of your body weight from your muscles and joints, while reducing the impact that added pressure can have on sore muscles and joints. Combined with the resistance the water provides, you can enjoy a low-impact and comfortable water workout from the comfort of your backyard. These are just the beginning! You could also incorporate water aerobics and/or yoga into your routine to spice things up! Technology seems to follow us everywhere we go. Kids can’t put down their tablets and mobile devices, while adults seem to be glued to the computer screen and TV after a long day of work. Let that addiction to electronics become a thing of the past while you’re in the pool. It’s no surprise that a swimming pool might not be an ideal place to bring your mobile device, due to the damage water can have on it. Use the time spent in the pool to get away from your electronics, if only for 30 minutes! Did you find the information in this article helpful? Well, there’s lots more where that came from! Take a peek at the other posts in our blog section to learn more about pool installations, benefits of owning a spa, what a swim spa is, and everything you need to know about owning a sauna! For more information about our above-ground and in-ground pools for sale in Camp Hill, Carlisle, Harrisburg, Lancaster, and Lebanon, contact our team of experts at Goodall Pools today.